Without compromise, the color experts at Pantone describe Living Coral—the 2019 Color of the Year—as an appropriately vibrant and dramatic refl ection of our cultural times. After years of muted grays and contemporary earth tones dictating design, bright colors are poised for a big comeback as consumers seek captivation and positivity from more immersive and experiential palettes. When it comes to residential color schemes, paint makers are following suit by ditching the boring for the bold, with Sherwin-Williams tapping a sun-splashed Cavern Clay as its color of the year and Behr naming its emotive, teal-hued Blueprint as the top tone for 2019. With the development of new anti-fade technologies, siding manufacturers have also been able to adopt bolder hues without fear of UV degradation, and the return of color has triggered a companion trend for mixing products and profiles as homeowners embrace creativity in their cladding. Monogram siding features a rough cedar finish molded from real boards and is tested to withstand wind loads up to 220 mph. Low-maintenance vinyl construction has a Class 1 fire rating and features a self-aligning lock for secure installation. 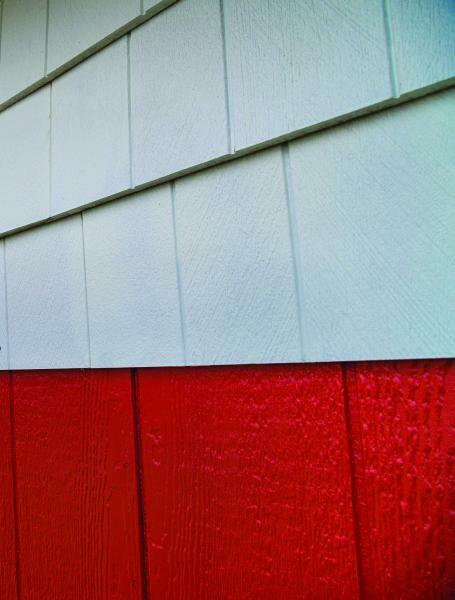 Until recently, homeowners looking for the boldest, brightest, and deepest exterior colors were forced to seek out paintable cladding options, but advancements in UV-protection technologies have enabled vinyl and PVC siding makers to get into the color game, too. 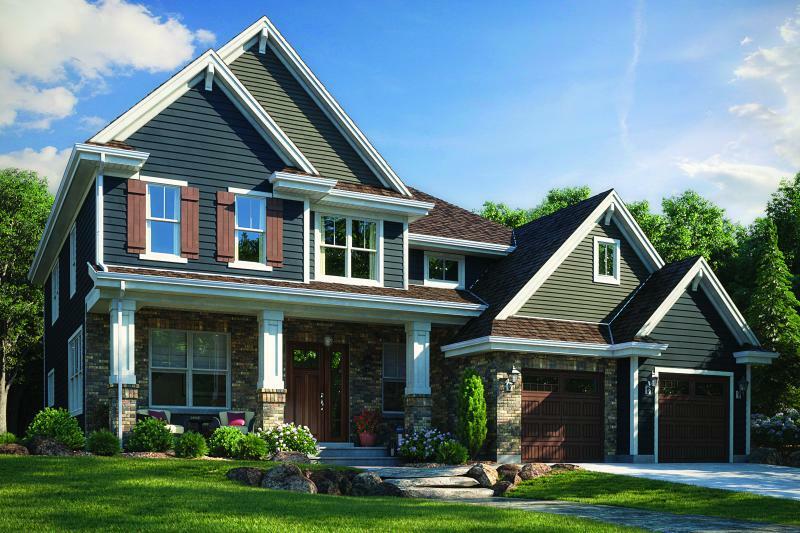 Cary, N.C.-based Ply Gem, for example, last year introduced its SolarDefense siding in conjunction with five bold color lines. The formula uses cooling compounds and three protective layers to scatter light energy and reflect heat to protect against UV exposure that may have faded bolder colors in the past. The SmartSide Perfection Shingle features fine sawn-wood texture without knots. Pre-primed for enhanced paint adhesion, shingles have a cedar grain texture with a 5 1/2-to-6 1/2-inch reveal. Shingles are designed to be used on their own or to complement other cladding. 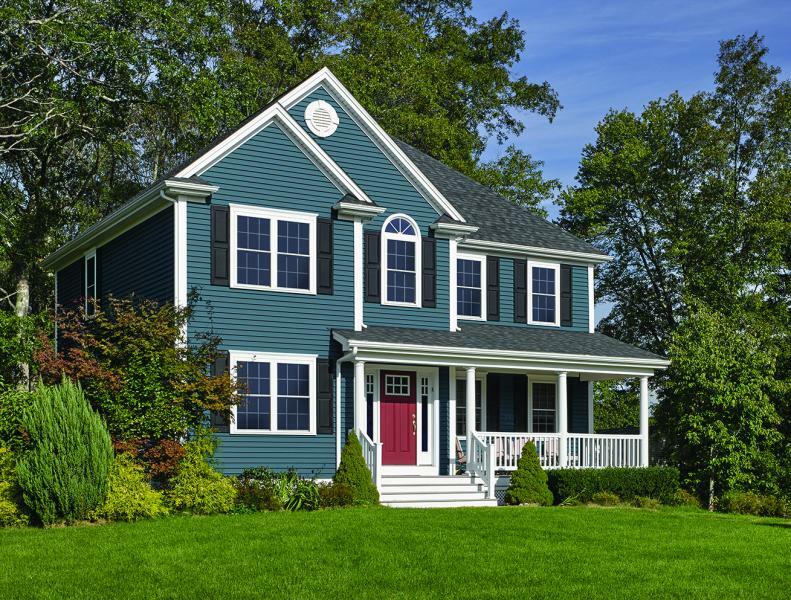 LP Building Products has similarly been working to make its engineered wood siding products better able to withstand impact, freeze-thaw cycles, and high humidity. Because the company’s LP SmartSide products have a wood substrate, there are no issues with effl orescence when the siding is painted, and the brand’s prefi nishers offer paint coatings with warranties up to twice those available on other substrates—based on paint manufacturer performance testing—the company claims. 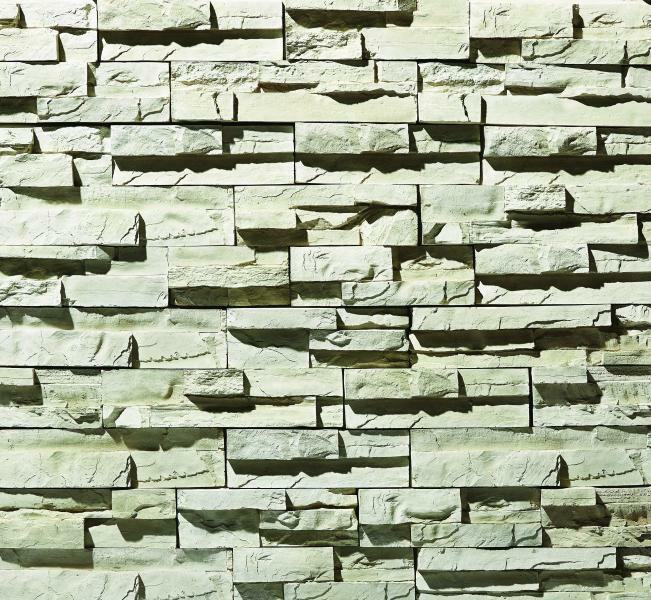 Versetta Stone mortarless veneer panels provide stone texture without tricky installation. Carved Block panels feature stones ranging from 16 to 20 inches wide by 8 inches tall oriented across a 36-inch-by-8-inch panel in two colors, Midnight or Sea Salt (shown). Not surprisingly, homeowners continue to seek low maintenance as well, particularly when products are coupled with enhanced durability or resistance to extreme weather and wildfire. 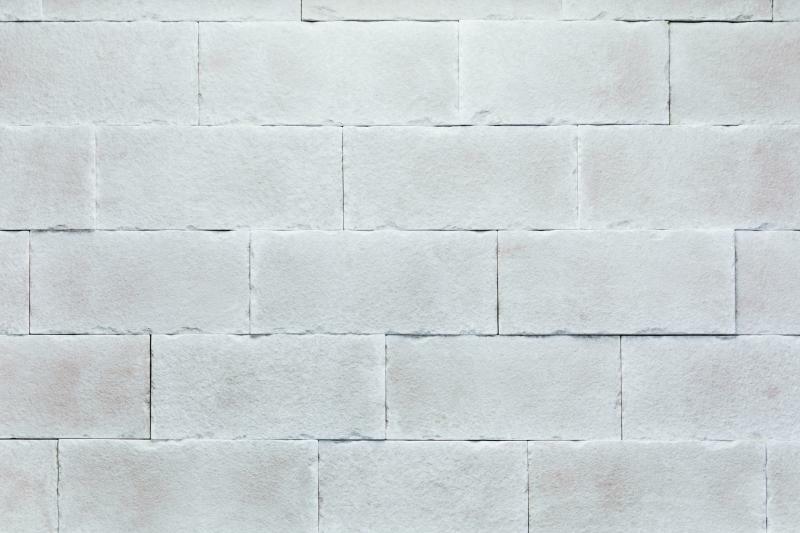 Boral’s Versetta Stone, for example, offers the durability of a cement-based stone veneer engineered to perform in the heat, cold, and rain, and offers 110-mile-per-hour wind resistance. With the move to bolder colors and mixing materials, siding makers are also investing more resources in smartphone apps and online tools to help contractors and buyers visualize color and product options on their homes. Mastic SolarDefense vinyl siding features three protective layers to scatter light energy, disperse heat, and resist UV fading. Available in 10 bold colors including dark blue, brown, and red, the outer surface, color pigments, and substrate are molecularly bonded for enhanced durability. The Ply Gem Home Exterior Visualizer tool, for example, includes preset color palettes for easy color selection of Ply Gem siding, stone, and windows. Contractors can upload a photo of a home for a virtual remodel so homeowners can prepare for what the exterior will look like, before making a commitment. Clipstone veneers are available in a variety of natural stone and simulated wood-grain profiles, including three new colors in the Barn Wood collection and the arctic-inspired Osceola stone veneer (shown). The siding is available in a wide range of panel sizes with veneer ranging from 2 to 3 1/2 inches thick.